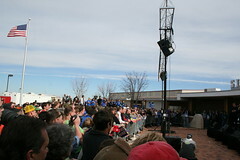 This morning I went to the Mike Huckabee Rally in Lubbock, Tx with my mom, Jonny and Daniel. The morning started out kind of cold, but warmed up as we listened to music by the Josh Abbott Band and waited for Huck to appear. After about a half hour of music Mike got on stage and played the Bass with the band including a couple of bass solos (which were quite good by the way). After the music Mike delivered yet another heart warming speech to the delight of the crowd (which was very polite and let Mike speak without too many interruptions). After speaking Mike, his wife Janet, Chuck and his wife Gena walked along the front of the crowd shaking hands and signing their autographs. I got to shake Mike and Janet Huckabee's hands and Jonny got to shake Mike, Janet and Chuck's hands. We also got several autographs. 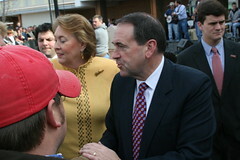 Mike and Janet Huckabee shaking hands after the rally. People in the crowd during the event. You can see more pictures from the rally Here on Flickr. Pictures courtesy of the Russell Family. Tuesday night at 7:00pm VOCL held a Voter's Clinic in the Springtown/Azle area. 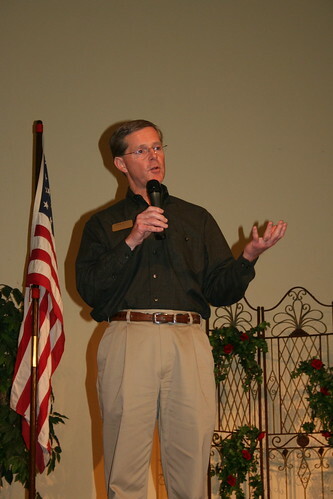 The event was held at Real Family Fellowship Church in Azle, Tx and was moderated by Mr. Jon Moffett. Phil King answering Questions from the audience. 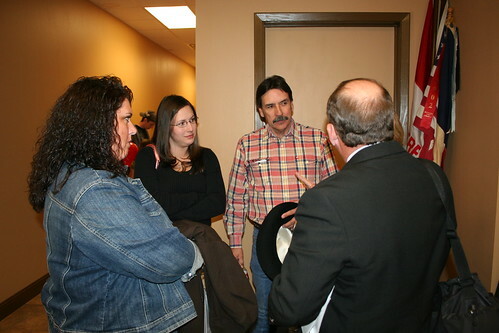 George Conley and Larry Lippincott talking with attendees after the event. You can view more pictures from the event on flickr by clicking here. Yesterday I was reminded of how simple life is through the eyes of a child. While we were getting dinner ready and getting all the ingredients together my mom asked one of us to get the evaporated milk. When Stephen (my little brother) heard that he got a great idea, we should make some evaporating cheese! in his mind it made perfect sense, if regular cheese comes from regular milk then you should be able to make evaporating cheese out of evaporating milk. Very logical. Sometimes I think that "grownups" should take a few lessons from kids, we tend to think of things in illogical ways. "Don't be silly you can't make evaporating cheese out of evaporation milk, that's just stupid." No it isn't, it is imaginative and creative. Kids have an amazing ability to see things outside of the box, they aren't limited by what everyone else says is true or acceptable. I think that this is one of the reasons that Jesus said "Let the little children come to me..." children are not hindered by impossibilities. It doesn't matter if it is physically impossible to make evaporating cheese or fly to the moon in a cardboard box, in the mind of a child anything is possible. This is true faith, the kind of faith that can move mountains, faith that is not limited by what we see with our physical eyes or what others tell us. This kind of faith comes by seeing life through the eyes and mind of a child, a place where impossibilities do not exist and where "I can do all things through Christ who strengthens me"
In the business of everyday life it is often hard to remember to pray for Life in the Supreme Courts and pray for the Justices of our Supreme Courts. To help you remember I would like to share this resource. I designed this poster for me and my family to use as a reminder in our house but I would like to share it in the hope that it will be useful to others. The file is a PDF and is 4.5 MB in size, you can either download it here or from the resources section of my website. 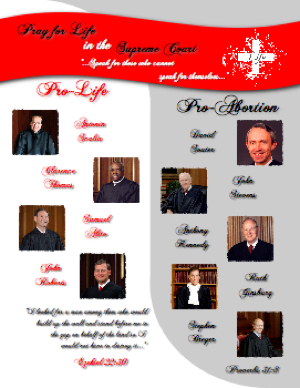 Print out this poster on 8.5in by 11in paper to use as a visual reminder to pray for the leadership in our Supreme Courts and to pray for a ruling of Life to be made by them.